Please note: All orders since January 15, 2018 already shipped with the new V3.2 Prebuilt Kit or PCB Set. In V3.2 there have been some small changes to the Arduino and the Mosfet board. It is now possible for the user to assemble the prebuilt kits completely without soldering. This was achieved by changing the pad distance of the 12V and GND input pads on the Arduino board to 3.5mm. The prebuilt kits from now on will come with a screw terminal installed to these pads. If you built the Spot Welder on your own you have the choice to use a srew terminal or directly solder wires to the pads. the Arduino Board was updated so it is now possible to mount a 3.5mm screw terminal to the input pads. the voltage measurement now connects directly to the 12V input pad instead of behind the schottky diode. This guarantuees a more precise voltage measurement. the 8 small SMAJ13A-13-F TVS diodes have been removed from the mosfet board. There is now one of these diodes on the Arduino board that protects all mosfet gates at once. If you bought end of december you should have V3.1. 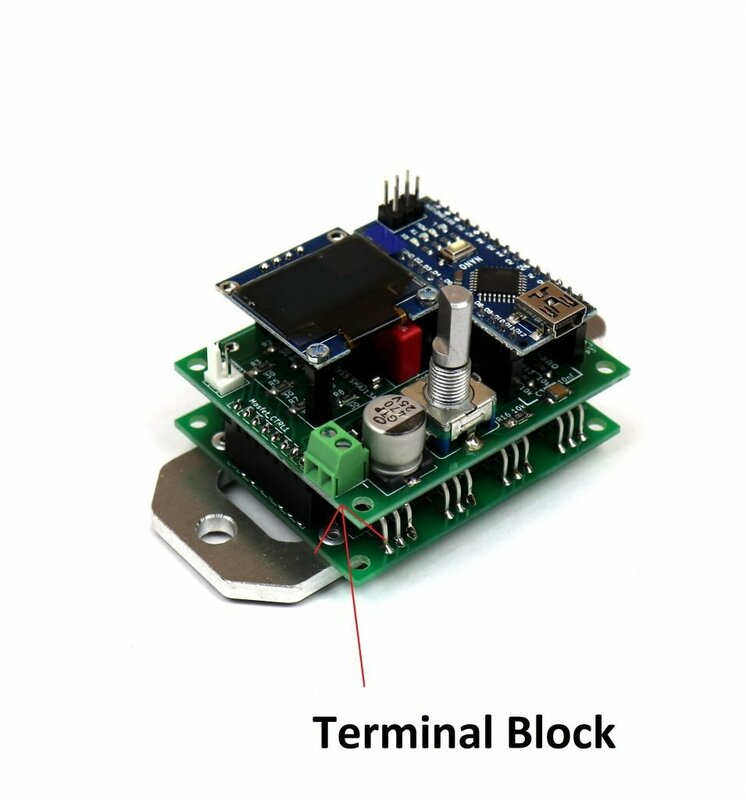 You could install a 3.5mm terminal block on the Arduino board. It should fit in pretty easy. When I want to buy the complete kit, what else do I need to complete my setup and start welding? Please take a look at the prebuilt kit product page. There i have listed the minimum setup and the optional additions. Thanks, ordered the parts needed. Nice product! But take care of the units! “ms” is milli seconds, “mS” is milli Siemens, the unit for inverse resistance aka conductivity. Though you write “duration” it could be mistaken. Not a problem at all, but it’s like a dent in an otherwise good product! Thanks for the hint. I did not think about that “ms” “mS” differnce. Hello, one question i wish to weld 0.3mm nickel tabs and 0.5mm copper tabs. i was planning on using 3000Amp max for the lastest . Is it possible to put 3 units in parallèle and command them with one pedal ? i have 35mm² gauge wires and tungsten carbide electrodes to weld them. Do you think this is ok . If yes 3 is enough or should i go for 4 units? In case 3 units are in paralell for example: Lets assume one unit has a bit less system resitance as the other ones or it switches on a bit faster due to parts tolerances. Then this one will see much more current. For example: Unit1: 500A Unit2 500A Unit3: 2000A . Or if Uniit 3 switches on faster (few micro seconds is enough on this high current) it will even see he full 3000A. This will blow up Unit 3 imideatley. Then only Unit 1 and 2 are left to handle the 3000A so now they see 1500A each and will also fail. So in worst case you will blow up all units at once if they are not perfectly in sync. Excuse me, the 8 TVS diodes where is it? They are not necessary anymore, because there is now one of these diodes on the Arduino board that protects all mosfet gates at once.